Hose Burst Security | Tucson Hydrocontrols Pvt. Ltd.
With the ascent of the involvement of safety regulating bodies in equipment manufacturers coupled with end users becoming more conscious about the safety features in their equipment in the last few decades, the design departments of OEM companies were in a tizzy to develop the safest and most reliable operating equipment. The International Standards Organization concluded that all excavators would have to function as cranes. This implied that the earth moving equipment would now have to have a provision to hold the load in place as well as have a system in place to prevent failure in case of a hose burst situation. One out of the many safety concerns were, what happens if the hose connecting the cylinder to the valve was to rupture? Without any failsafe in place, ruptured hoses would allow for the oil pressurized in the cylinder to have a free path to atmosphere. This would bring the load down catastrophically causing massive damage to man and machinery. Since there were not many options to rely on, some Italian companies developed what was called a “Hose Rupture” or a “Hose Burst” valve. It is, in fact, a “Velocity Fuse”. The valve functions on one of the fundamental principles of hydraulics, the pressure drop created across an orifice. The term “drop” is used to imply that the pressure is always lesser downstream. More the flow across the orifice, greater is the pressure differential between the inlet and outlet. 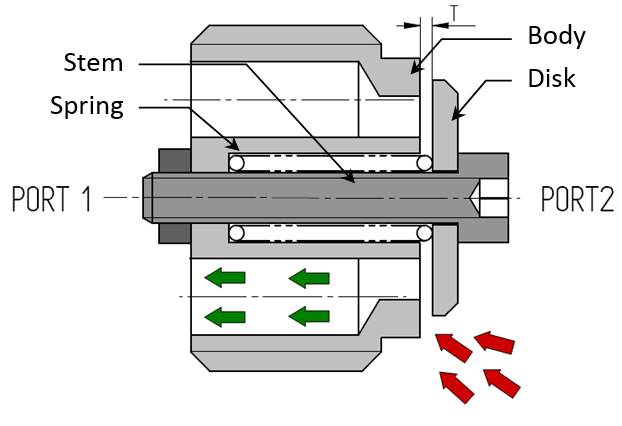 The velocity fuse is composed of a body with a central stem that retains a disk (Figure 1). The stem is secured on one side by a locknut while the disk is held in place by a spring. The thickness of the gap between the body and the disk is essential as it is this distance that regulates the flow of oil out of the actuator and prevents failure in case of a hose burst. Radial holes around the circumference provide a path for the oil from one port to another. 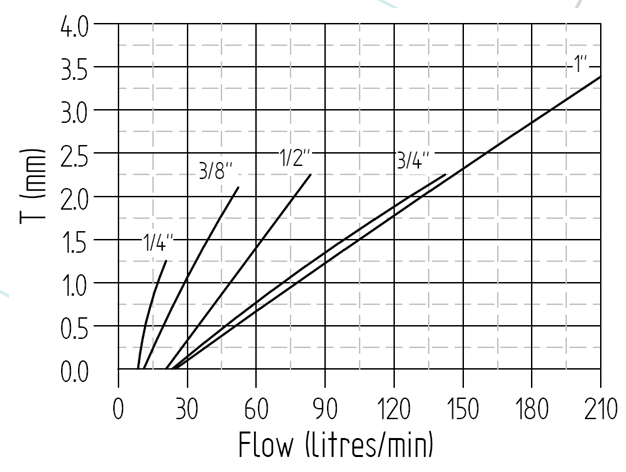 The pressure drop relationship to the flow and gap spacing is given in Graph 1 for various sizes of the hose burst valve. The graph is an approximation of the setting to be achieved as the entire system is quite crude and cannot guarantee that the valve will close at the required flow rates. When the differential force caused by the flow across the gap “T” reaches that exerted by spring, the disk closes and the flow stops. The pressure on Port 2 then holds the disk closed to lock the load in place. This is very similar to blow out of an electrical fuse that melts and closes the connection when there is a spike in the current. Valve is generally set by adjusting the gap ‘T’ from the graph above. This is a standard procedure setting and although quite easy, is not accurate since variations in valve manufacture govern it mechanics more than standardized graphs. The alternative is to set approximately to the required flow and then iterate the gap using a flow meter to check the flow. The latter method is time consuming although it gives a more accurate result. Moreover, the setting may not be the same on the field as on the test stand as the viscosity of the oil can alter the flow rate. The pressure drop in the opposite direction (PoRt 1 to Port 2) will increase as the setting, and consequently gap T, is reduced. It is best to locate the valve in the cylinder port by using its cartridge form. Else, line mounted (male-male or male-female) bodies can be used. How safe is the Velocity Fuse? The Velocity Fuse may not be the best way to do the job, but it is cheap. It has carved out a niche so strong that customers do not want to look past the valve for an alternative. It retains its popularity in Italy although in India it can still be found on some archaic cranes. The main issue with the Velocity Fuse is that what is needed is the exact definition of the term “Hose Burst”. If it is set for very high flow, small cuts in the hose and small opening in the fittings will not be detected by the fuse and can be dangerous. If set for a very low flow so as to be able to detect these problems, passing heavier flows through the valve will be difficult. Hence judicious methods of flow setting are required. Another problem with the hose burst is that the load, although held in place, now has no simple means of being lowered back down to safety. Once the fuse is shut, the only way to open it would be to apply pressure at Port 1 to reduce the pressure differential across the seal. In case of the hose being ruptured, this would entail that the load can be lowered only after fitting a new hose and completing the hydraulic circuit. There is no way to bring the load down simply by draining the oil to atmosphere. In the Overcentre valve the flow is free from Port V to Port C over the check valve, but reverse flow is blocked and can only be opened by the pilot pressure acting on Port P along with the load pressure on Port C.Instead of Velocity fuses to control the load in case of a hose rupture, the safer option is to install an Overcentre valves. These load controlling valves are typically mounted on the cap of a linear actuator or they can be line mounted with rigid piping between the actuator and the valve. 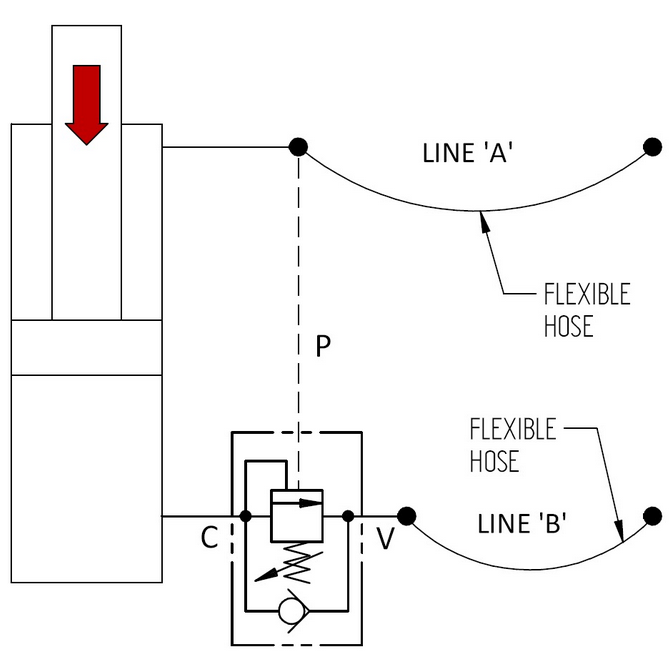 Figure 3: Rigid Piping is used between the valve and the cylinder to prevent accidental hose burst in these lines. The cartridge can even be mounted in a cavity machined in the cylinder. The cylinder port of the valve is connected to one end of the cylinder while the valve port is connected to the directional control valve (see figure). The pilot port is connected to the oppositeend of the actuator and serves as a pressure feedback. For retraction, the Overcentre valve restricts the flow of oil out of the cap end which results in the pressure rising at the opposite end. This pressure is sensed at the pilot port of the Overcentre valve which, assisted by the load induced pressure, compresses the spring giving an outlet to the oil from the cap end. In this way, hose burst protection can be offered safely and securely to almost any hydraulic cylinder, without the use of archaic technology.Since the piping is rigid between the cylinder and the overcentre valve, hose burst can only occur in Line A or between the overcentre valve and the directional control in Line B. 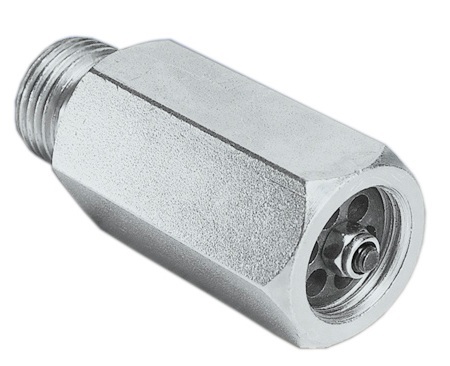 In this case, the flow out of the cap end would not change since the load induced pressure would still act in conjunction with the pilot pressure on the spring to allow the load to lower. The only change would be the leakage from the burst hose.